Toshiba has unveiled three new camera modules it has created for the latest prototype of Google's modular smartphone project, Project Ara. The Japanese firm is among many third-party firms on board, developing for Google's ambitious smartphone with interchangeable components, and has demoed the first-ever swappable camera module for the Ara ecosystem in a YouTube video, as embedded below. The modules shown off by Toshiba include a 5MP and 13MP rear-facing camera, and a 2MP front snapper. These demo modules form part of the first phase of the company's three-stage development plan it hopes to complete during 2016. Phase 2 will see Toshiba offer a wider selection of camera modules whilst the tech giant is expected to bring "unique modules" to the table in phase 3, according to Tech Times. The 13MP camera presented is not far off from the flagship-level modules that were promised by Google as it features both a 'bright mode' and high frame rate capabilities. Toshiba is preparing modules in 1x1, 1x2 and 2x2 sizes in the near future, packing in NFC capabilities, Transfer Jet and wireless charging features that are expected to be released this year. 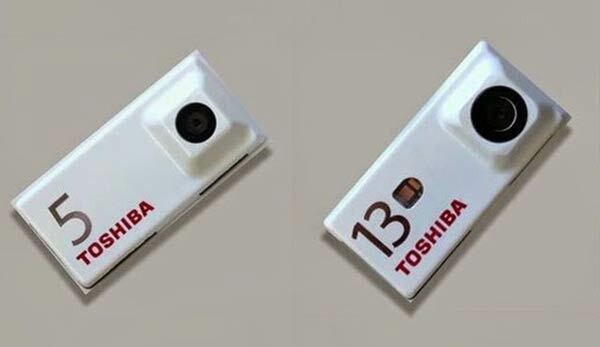 Toshiba's camera sensors will be priced between $50 (£32) and $500 (£325). "We have image sensors coming in various megapixel range: 8 Mpx, 13 Mpx, 20 Mpx. They all come in different optical format, with different frame rate," said Shardul Kazi, senior vice president of Toshiba America. During the second Project Ara Developer Conference held earlier this year, Google took the wraps off the Spiral 2 design which supported modules that are traditionally found on regular smartphones, such as display, headset, speakerphone, Bluetooth and Wi-Fi, 3G module, camera, Micro USB, battery and processor. Google plans to create the next prototype, the Spiral 3, before launching a retail test program in Puerto Rico later this year. It hopes to keep manufacturing costs down for the basic phone, at around $50 in order to appeal to the masses, with a goal of eventually offering several dozen third-party modules to consumers. However, it remains to be seen what prices the third-party modules will retail at when they are released. A recent report tipped that Google will apparently show off up to 50 components for Project Ara at MWC in Barcelona next month. Although rumours suggest that not all of the modules will be in a finished working condition, we can expect to see a complete working version of an Ara modular smartphone at the show. Ara gets more interesting by the week - although I'm less than convinced by the lens (?) bulge on these Toshiba modules - thinking that the resulting phone is going to look a big naff. I have to say I'm watching this one with interest, consider these are Gen 1 I think we will some less than ordinary designs until we see more iterations and alternatives from competitors. Hope all the module manufacturers don't all stick their logos on the back and use ever-so-slightly different shades of white plastic. It'd be enough to put me right off Project Patchwork. Heh can just imagine the back of your phone being a series of different company logos.